February 11, 2013 - Charles Hood #000982 Re-sentenced to life last week, He will not receive credit for the 23 years he has spent on death row Texas. WASHINGTON - Earlier today, 21 former judges, government officials, and prosecutors filed an amicus brief in support of Charles Dean Hood's petition to the United States Supreme Court, asking the Court to hear the case. Hood was sentenced to death in 1990 for a double murder, but has long protested that his constitutional right to a fair trial was violated due to the romantic relationship between the prosecutor in his case and the judge presiding over his trial. In 2008, a Texas court ordered both the judge and prosecutor be deposed after years of their refusing to do so, and both finally admitted the relationship. Nevertheless, in September 2009, the Texas Court of Criminal Appeals denied Hood's habeas petition as untimely based on state procedural rules. Today's brief, organized by the Constitution Project, requests the Supreme Court review the decision of the Texas Court of Criminal Appeals, based on the clear due process violation that occurred in Mr. Hood's case. "The conduct of the trial judge and prosecutor in a proceeding that resulted in imposition of the death penalty, combined with the short shrift given to petitioner's claim by the Court of Criminal Appeals, cast grave doubt on the impartiality and fairness of the trial in this case and tarnish significantly the reputation of the judiciary as a whole. This Court likely is the last court with an opportunity to prevent the infliction of this serious harm-both to petitioner and to the judiciary." In September 2008, the Constitution Project organized a letter to Texas Governor Rick Perry signed by former federal and state judges and prosecutors from across the country, urging the governor to grant a reprieve for Mr. Hood, who was then slated for execution within days. new death date for Sept. 10, 2008 !! Late Tuesday Sept. 9, 2008 the Texas Court of Criminal Appeals granted Hood a stay -- but not because of the alleged affair. The court said it would reconsider its previous dismissal of Hood's appeal challenging jury instructions. At the same time, the court dismissed claims that Hood had been denied a fair trial because of the alleged affair, the Associated Press reported. Charges of corrupted justice in the Collin County murder trial of Charles Dean Hood will get an overdue airing in court Monday. The inquiry should be complete and conclusive on whether the trial judge and the district attorney who prosecuted the case were having a secret affair when Mr. Hood was convicted of capital murder in 1990. It should involve the opportunity for former state District Judge Verla Sue Holland and former DA Tom O'Connell to address sworn, but unproven, allegations of unethical and unconstitutional behavior. It goes without saying that the inquiry should move with urgency, since the defendant's execution is set for Wednesday. For weeks, the radioactive murder case careened from courtroom to courtroom, and the ideal of sure and swift justice seemed like a pathetic afterthought. In a chaotic spectacle on June 17, Mr. Hood came within 90 minutes of execution, only to have the warrant withdrawn and reinstated hours later. Prison staff could not squeeze in the execution routine before the midnight deadline, which is the only reason that attorneys can still dissect what was going on in the county courthouse 18 years ago. Various courts appeared to deflect the core question of judicial corruption until Thursday, when state District Judge Greg Brewer ordered a hearing on the matter. That shows spine. In any salacious talk of secret trysts, it mustn't be lost that the case stems from the heartless murders of Ronald Williamson and Tracie Lynn Wallace of Plano. A jury found that Mr. Hood was the killer, but the conviction can't involve lingering doubts of a rigged case no matter how clear the evidence of guilt. Attorney General Greg Abbott said as much in an extraordinary statement last week urging thorough review. Even the most ardent law-and-order Texan must agree with Mr. Abbott that "if the execution proceeds as scheduled, before questions about the fairness of his trial are legally resolved, neither the victims nor justice will be served." Indeed, if Judge Brewer's fact-finding needed more time, with the execution date looming, Gov. Rick Perry should heed the wisdom expressed in a letter by more than two dozen federal and state judges and prosecutors who urged him to issue a one-time, 30-day reprieve. DMN-Editorial "DOUBTS" RE: Hood & Notes on another case. June 18th, 2008 -Texas death row inmate Charles Dean Hood is still alive -- for now. His execution was cancelled minutes before midnight Tuesday because prison officials feared they could not follow the proper procedures in time after a flurry of appeals delayed the original scheduled execution. !! And again ... Charles Dean Hood, now 38, is set to be put to death June 17 2008 !! Salon reported on an alleged affair between judge and prosecutor in a Texas murder trial. Now, days before Charles Hood's scheduled execution, his lawyers make the allegation in court papers. The gurney sits empty in the death chamber in Huntsville, Texas. June 14, 2008 | Rarely in the annals of criminal justice does a conflict of interest get more sordid or have greater consequences than this. Charles Dean Hood is scheduled to be executed in Texas on Tuesday morning. In 1990, when he was on trial for capital murder in the Dallas suburbs, the presiding judge who imposed that death sentence and the local prosecutor who was trying to have Hood put to death had been involved in a "long-term intimate relationship." That's according to papers filed by Hood's attorneys in two Texas courts Thursday. Hood's lawyers allege that Texas state court Judge Verla Sue Holland had a "personal and direct interest in the outcome of the case," and was disqualified from trying the case under the Texas Constitution because of her ongoing affair with Collin County District Attorney Tom O'Connell. Hood's lawyers are seeking a stay of execution and the reversal of his conviction and death sentence. Allegations that Judge Holland and District Attorney O'Connell were romantically involved when Holland presided over the murder case prosecuted by O'Connell were first reported in Salon in June 2005. But yesterday's petition, which cites the original Salon report, marks the first time Hood's lawyers have taken the matter to court. The "wall of silence that has long protected Judge Holland must now come down," the lawyers argue in their filing. Hood's claims rely in part on Matthew Goeller, who was an assistant district attorney in O'Connell's office at the time of Hood's conviction. 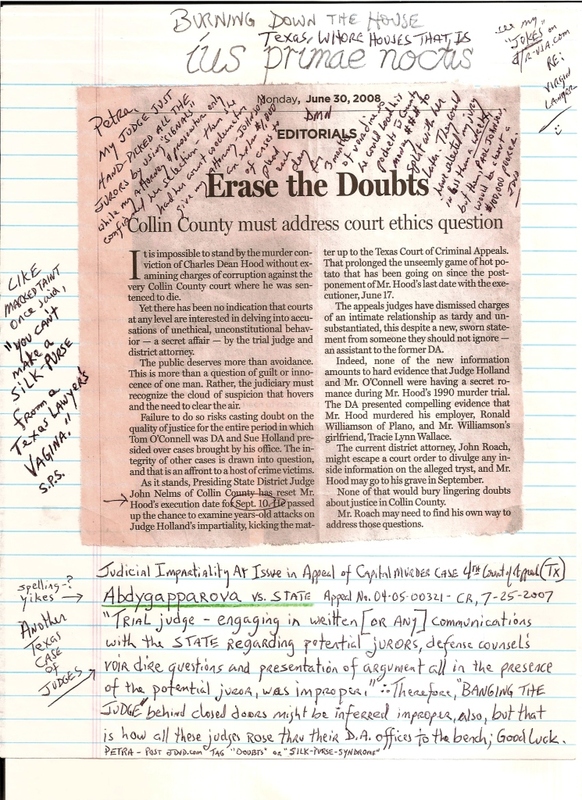 Goeller signed an affidavit earlier this month, nearly 18 years after Hood's conviction, stating that "it was common knowledge in the District Attorney's Office, and the Collin County Bar, in general," that O'Connell and Holland "had a romantic relationship." According to Goeller, "This relationship ... was in existence in 1987 when I joined the District Attorney's Office, and continued until approximately 1993." Neither the judge nor the prosecutor has publicly confirmed or denied the relationship. Neither returned phone calls yesterday. Asked about the case and any such relationship in 2005, Holland told Salon it would be "unethical to comment" about a pending case and refused comment on her personal ties with O'Connell. Hood, 38, was sentenced to death in August 1990 for the 1989 murder of Ronald Williamson, 46, and Williamson's girlfriend, Tracie Wallace, 26. Hood had worked as Williamson's bodyguard and was living with him and Wallace at the time of the murders. The victims were found in Williamson's house. O'Connell and Assistant District Attorney John Schomburger prosecuted Hood. O'Connell delivered closing arguments in the penalty phase of the trial at which he asked the jury to sentence Hood to death. The jury sentenced him to death, a sentence imposed by Judge Holland the following day, as required by Texas law. Schomburger also did not respond to a request for comment. Lawyers for Hood admit they cannot prove that Judge Holland and D.A. O'Connell were having an affair, but they believe the law and the Texas Constitution oblige the courts to investigate the matter. "It's clear the parties did not want to make the affair public and they took steps at the time and now to keep it private," said Gregory W. Wiercioch, one of Hood's attorneys, insisting that Judge Holland was disqualified from hearing the case and that her judgment therefore has no authority. Wiercioch, an attorney with the private, nonprofit Texas Defender Service, a law firm that represents indigent capital defendants in Texas, says the courts should ask O'Connell and Holland to confirm or deny the relationship, arguing that asking Hood to offer concrete proof of a private affair is unreasonable. The Texas Constitution bars a judge from sitting in a case "where either of the parties may be connected with the judge, either by affinity or consanguinity." As district attorney, O'Connell represented the State of Texas, the party seeking to execute Hood. The constitution further states that "Public policy demands that the judge who sits in a case act with absolute impartiality. Beyond the demand that a judge be impartial, however, is the requirement that a judge appear to be impartial so that no doubts or suspicions exist as to the fairness or integrity of the court." Judge Verla Sue Holland was divorced from the late Earl Holland, a banker, in 1987. Friends of Earl Holland told Salon in 2005 that his wife had a relationship with O'Connell, and that it began while Judge Holland and Earl Holland were still married. One woman close to Earl Holland told Salon that Earl had a shoebox filled with tape recordings of his wife and O'Connell conversing. This source said, "I am 100 percent sure there was an affair." One of Earl Holland's closest friends said, there was "a mountain of circumstantial evidence of an affair," and that Earl Holland discussed the affair with him frequently, both while he was married to Judge Holland and after. Earlier this week, Ray Wheless, a Collin County judge who previously argued cases before Judge Holland, told Salon that he had asked Judge Holland to recuse herself in a family law case in 1987 in which O'Connell was representing one of the parties and Wheless the other. Wheless said there was "a lot of speculation about that relationship" and "a long history of them being close friends." Wheless' recusal motion makes no mention of a romantic relationship, but notes that O'Connell represented Holland's sister in a divorce matter, and that "Judge Holland was previously employed by Tom O'Connell as an assistant district attorney." Wheless argued that both the attorney-client relationship and the employer-employee relationship created potential conflicts of interest. Hood's original attorney, David K. Haynes, also signed an affidavit filed yesterday stating that he was "aware of rumors concerning a romantic relationship" at the time of the trial. But Haynes never mentioned the matter when his client was facing a death sentence. Court records show that Holland presided over at least six other cases argued by O'Connell during the six-year period in which Goeller says they were romantically involved, and numerous other cases before and after. Were a court to overrule Hood's conviction based on a finding that Judge Holland had compromised her office, judgments in all of these cases could be called into question. Judge Holland served on the state district court from 1981 through 1996 and then on the Texas Court of Criminal Appeals (CCA) until 2001. Hood's lawyers filed their motions in both courts. Seven of the nine judges now on the CCA served with Holland. O'Connell retired from the prosecutor's office in 2001 and practices law in Plano. Hood's lawyers also filed a petition with Texas Gov. Rick Perry, seeking a 30-day reprieve so that the new evidence can be considered by the courts. The state has 120 days to examine the case, although an extension is possible. When the judge and prosecutor involved in a capital case are sleeping together, can the defendant possibly get a fair trial? 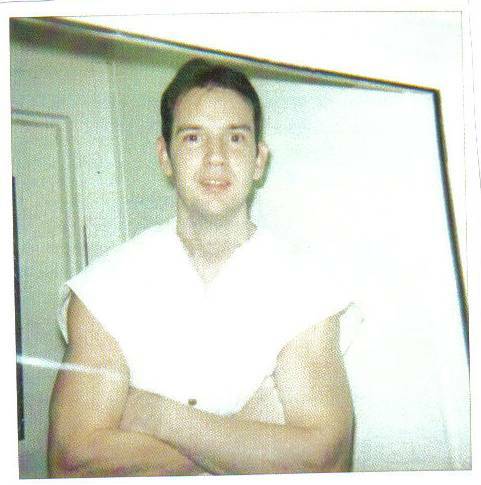 Meet Charles Dean Hood, on Texas' death row. Jun 24, 2005 | Here's a not very tough question of legal ethics to ponder over the morning coffee: Let's say you're on trial for murder, and the judge and the prosecutor in your case have been having an affair. Is it possible for you to get a fair trial? In the case of Charles Dean Hood, the short answer is, "Don't bet your life on it." Hood, who was sentenced to death for a 1989 double murder, is scheduled to be executed by the state of Texas on June 30. Unfortunately for Hood, in the 15 years since he arrived on death row, the issue of the strange and not-so-secret relationship of State District Court Judge Verla Sue Holland and Collin County District Attorney Tom O'Connell has never been raised in a single state or federal court. Now, it should be stated at the outset that the private affairs of public officials, including extra-marital relations, should under all but the most extraordinary circumstances remain solely the business of the parties involved. But when a person is charged with a serious crime and his life hangs in the balance, such a private relationship may well become a matter of public interest, because the public has a right to know that the judicial process that prosecutors and judges swear to uphold will not be compromised. Hood was convicted in August 1990 of the brutal murders of his boss Ronald Williamson, 46, and Williamson's girlfriend, Tracie Wallace, 26. Hood worked as Williamson's bodyguard. Both victims were shot at close range in the head. Hood's bloody fingerprints were found at the crime scene. Although Hood's trial left a welter of unanswered questions -- about a possible accomplice, the motive for the killings, Hood's mental state, and the quality of Hood's representation, to name just a few -- there is little doubt that the state could easily have won a conviction of Hood by assigning a prosecutor whose presence in the courthouse would not raise a question of unethical conduct. Yet District Attorney Tom O'Connell chose to prosecute the case himself and not to reveal that he and Judge Holland had been involved in a long-running romantic relationship. Why O'Connell would have risked jeopardizing what had to have looked like a slam-dunk conviction over questions about his personal life is not at all clear, unless he was fairly confident that no one would dare to challenge him. O'Connell, who has since retired from public service, did not respond to phone calls seeking comment. For her part, Judge Holland refused to either confirm or deny the alleged relationship with O'Connell, insisting that it would be "unethical to comment" on a pending case. Asked if it was also unethical to try a case in which she had been romantically involved with the prosecutor, the judge said, "I'm not going to comment on anything, and I resent the fact that you're calling." Judge Holland, who served on the Collin County court for 15 years before being elected to the state criminal appeals court, has since retired. The Collin County District Attorney's Office, where O'Connell served for more than a decade, also refused to respond to written questions, as did John Schomburger, the assistant district attorney who prosecuted Hood with O'Connell. Close friends of the late Earl Holland, who was married to Verla Sue Holland for 17 years, say there is no question that she and O'Connell had an ongoing, intimate relationship that began while she was married to Earl, a prominent banker active in local Republican politics. Friends of Holland, who died earlier this year, insist that he told them the affair was the precipitating factor in his decision to file for divorce. "I am 100 percent sure that there was an affair," said one woman who refused to be named. This source recounted having listened to tape recordings Earl Holland obtained of conversations between the judge and O'Connell that provided irrefutable evidence that the two were intimately involved. Earl Holland had collected an entire "shoe box" of these recordings, she said, but she did not know how he obtained them. Holland's friend said Holland "thought he [O'Connell] was a family friend," and invited him often to his home, only to learn later that O'Connell "was of course sleeping with Sue." Earl Holland became convinced that the alleged affair had gone on for several years before he learned about it. The divorce was finalized in October 1987. Sources differ on when the relationship ended; according to Holland's friend, the affair continued for at least a year after the divorce, possibly longer. 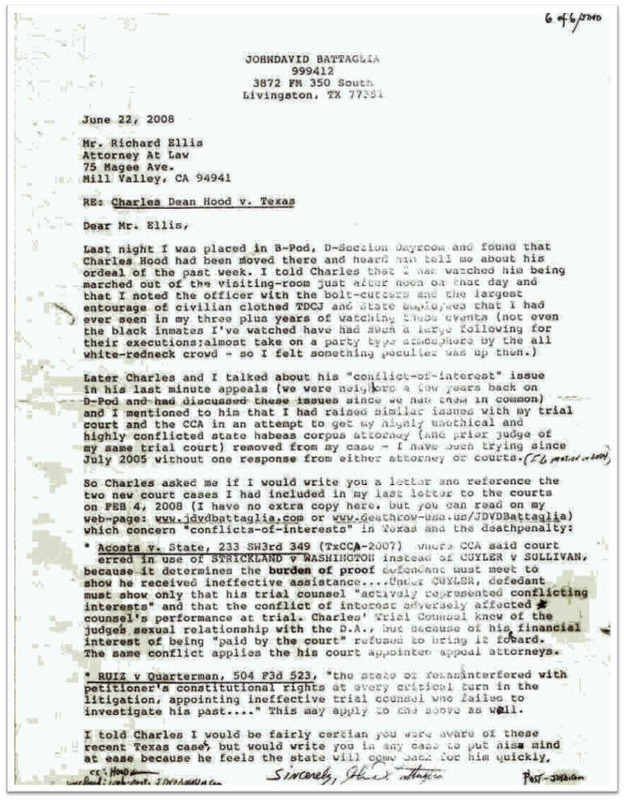 Another close personal friend in whom Earl Holland confided said there was "a mountain of circumstantial evidence of an affair," and that Earl Holland frequently discussed the alleged affair with him, both while he was married to Judge Holland and after. "Earl was convinced that they [Verla Sue and O'Connell] were having an affair. He was absolutely convinced." Hood's original trial lawyer, David K. Haynes, said, "Everyone in the courthouse had heard those rumors" about the judge and the DA. But Haynes said that without proof, he did not feel he could raise the issue at trial. Next Page: "At a minimum, there is no appearance of fairness in this case"
According to a report prepared by a private investigator in 1995 in connection with Hood's appeals, Haynes may have had other reasons for failing to pursue "those rumors." The report quotes a paralegal who worked for Haynes, Janet Heitmiller, claiming that her boss "feared raising the relationship as an issue in Dean's [Charles Dean Hood's] case would cost them points with the judge concerning other cases" he might argue before her. According to the investigator's report, Heitmiller learned of the alleged relationship while working for Haynes and believed that Judge Holland and O'Connell "were still dating up to a year after the case was resolved." The report, written by Tena S. Francis, also quotes a local attorney, Ray Wheless, as saying that "the judge and DA tried to keep their relationship as private as possible. People in the legal community knew about it, though, and the two could often be seen going to lunch together from the courthouse." The investigator concluded that "the relationship with O'Connell is what cost [Judge] Holland her marriage." The report added that Wheless "does not know why or how or when O'Connell's relationship with Holland ended." Now a Collin County judge, Wheless did not return phone calls to his home and office. Although Hood's appellate lawyers discussed the alleged affair over the years, the issue was never formally raised on any court proceeding. Today, Hood's trial attorney, David Haynes, says that evidence of the alleged affair "certainly would have made a difference in the way the defense was approached. It would have cast some doubt about the fairness of the tribunal." But he says there is no way to know for sure if rulings Judge Holland made against his client were prejudiced due to the alleged relationship with the district attorney. Richard Ellis, a San Francisco attorney now representing Hood, agrees that there is no way to connect Holland's rulings to allegations about her personal life, but he considers at least one of her decisions, refusing a defense request for a psychological evaluation, "totally out of the mainstream of judicial authority," given a Supreme Court ruling on the issue. Although Hood is not mentally retarded, a scientific presentation by a defense psychiatrist might have convinced the jury to forgo the death sentence. As a child, Hood suffered a traumatic head injury, and there was evidence that he was regularly whipped by his father. David R. Dow, a University of Houston law professor who is also working on the Hood matter, insists, "It is a red herring to look for particular things that are challengeable, because what you have in a case like this is a complete and fundamental breakdown of all the premises of the adversary system." Based on the relationship of the judge and the prosecutor, Dow says there is no question that Hood should be granted a new trial. "Any criminal defendant who stands to be sentenced to death is entitled to a proceeding that is not only fair, but has the appearance of fairness. At a minimum, there is no appearance of fairness in this case, and we have good reason to believe the judge made decisions that resulted in concrete harm. Did she make those decisions because she was sleeping with the prosecutor? Who knows. But we shouldn't have to engage in that kind of idle speculation." Dow says the judge should have recused herself from the case. Stephen Gillers, a professor of law at New York University Law School, agrees. One of the country's leading authorities on legal ethics, Gillers said, "There's no question -- it's incontrovertible -- this justice should not have sat in this case, at least not without informed consent on the record from the defense ... The public has a right to complete confidence in the court's disinterestedness, in the court's objectivity. It's simply not possible to know how the case might have gone differently or how the rulings might have been altered absent this relationship." Gillers cited the widely used ABA Code of Judicial Conduct, which provides that "A judge shall disqualify himself or herself in a proceeding in which the judge's impartiality might reasonably be questioned." Where there is doubt, a judge is obliged to disclose information that lawyers might consider relevant to the question of disqualification. Citing the same provision, Hofstra law professor Monroe Freedman, author of "Understanding Lawyers' Ethics," said, "Beyond any doubt, a judge's romantic involvement with a lawyer appearing before him 'might' cause a reasonable person to 'question' his impartiality. I am confident that no one who works in the field of judges' ethics would take a different view from mine in this case." Hood, 36, may have some of the country's top legal ethicists on his side, but getting the courts to grant him a new trial is another matter. If Judge Holland's behavior in the case is challenged, the state will almost certainly argue that the defense still cannot prove that her rulings were prejudiced or that they would have changed the outcome of the jury's deliberations. With his execution date imminent, Hood's lawyers have raised several other legal issues. On Thursday, the Supreme Court was scheduled to hear Hood's appeal for a new DNA test, with a decision expected on Monday. Hood's lawyers are also contesting the constitutionality of the Texas jury instructions given at his trial, which used the same language as instructions since deemed unconstitutional by the Supreme Court. Greetings to whom maybe interested in a friendship with me. whoever writes I'm greatful to all. Personality-guess I'm a funny kind, a guy with good character. /ou find yourself under in these circumstances. Ich grüße alle, die möglicherweise Interesse an einer Freundschaft mit mir haben. Ich suche jemanden, der möglichst in meinem Alter ist (34 Jahre alt), aber dennoch bin ich über jeden, der mir schreibt, dankbar. Bitte lass mich Dir ein wenig über mich erzählen, damit du ein Gefühl bekommst, wem Du schreibst. Persönlichkeit – ich denke, ich bin ein lustiger Kerl, einer mit gutem Charakter. Ich bin ein Künstler, was natürlich da, wo ich bin, hilft, den Streß unter den gegebenen Voraussetzungen zu verringern. Hoffe, Du wirst mir eine Chance geben. Danke!